Are you religious when it comes to hitting the pavement and putting in the miles, and yet you can't lose the weight (or maybe you're even gaining!)?? It's time to eat the right foods and to do the right exercises. It's time to get you results for all your hard work. One of the very best workout formula for fat loss (weight loss while preserving muscle) is a mix of cardio and strength training. One of the simplest ways to get this combination is through High Intensity Interval Training (HIIT). HIIT Workouts are super effective and can be done at home with absolutely zero equipment and within 10-30 minutes. When it comes to results, it's all about intensity not frequency. Changing from a slow, boring, hamsterwheel workout on the treadmill to a workout with short bursts of intense exercise may be the simplest way to super charge your metabolism and burn fat. How to do an Effective HIIT Workout. First of all, High Intensity Interval Training (HIIT) Workouts are alternating short periods of intense exercise with recovery periods. It’s as simple as doing some exercises and then resting. HIIT is a form of cardiovascular exercise and strength training (weights or body weight). And yes, HIIT will make you sweat, and get in the best shape of your life. It's All About the Timing. What I recommend is to get a timer (I use my phone) and time 30 seconds for the intense exercise portion and 30 seconds for your resting period. Repeat your intense exercise with the prescribed resting period as many times as you can within a set period. You can incorporate many different exercise combinations for your HIIT workouts. A full HIIT workout should take anywhere between 5 and 20 minutes max. What to do for your INTENSE Interval? During your intense burst of exercise, do jumping jacks, mountain climbers, sprints, jump squats, burpees, box jumps, push ups, jumping lunges, etc. Set your timer and get your heart racing. How to do a Recovery Interval? The rest period is to allow your body to rest so you can push yourself hard again for the upcoming burst of intense exercise. This should take 30-60 seconds. It's to allow you to catch your breath, but not long enough that you body is fully recovered. The goal is to keep your heart rate elevated. How to Keep your Workouts Fun? Don't do the same HIIT exercise once you start. Keeping your body guessing is a huge part of revving up your metabolism. So How to Get Started?? You can warm up to HIIT. If you can't do 30 seconds on and 30 seconds off, start with 20 seconds on and 40 seconds off. Listen to your body! Also, you can start with just a few minutes of HIIT about 2-3 sets per workout and work up from there. Overtime, you can build up to 10-15 minutes per HIIT workout and increase the number of HIIT workouts throughout the week. Another idea is to do intervals with your running. Try doing a light jog or a brisk walk for 30 seconds for your rest period, and then complete a fast run or a sprint for 30 seconds for your intense exercise interval, repeat 5-10x. Try out these 6 Free HIIT Workouts. Below are 6 HIIT Workouts that don't require any equipment so you can get started now. Bust these all out in a single week, or space them out over a couple of weeks. To increase intensity, try to complete each HIIT workout as fast as you can. Good luck! How to Add HIIT to your usual routine? 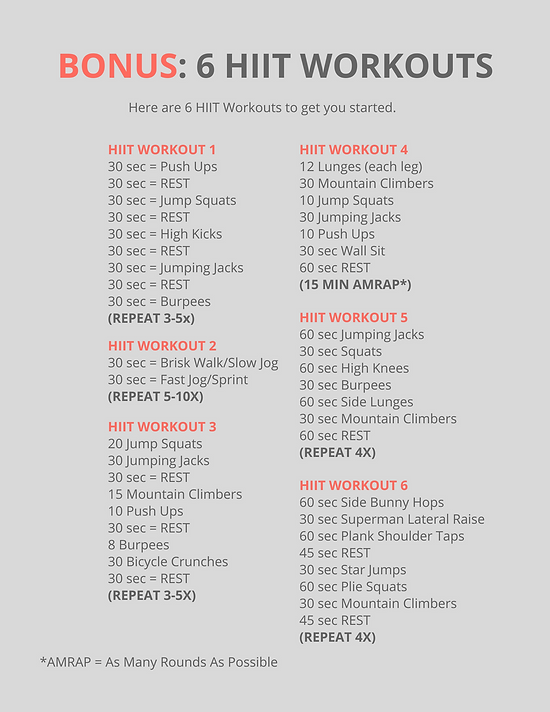 You can use HIIT as the main foundation of your workouts (about 3X a week for 15-20 min with each HIIT session) or you can sprinkle it into your already established cardio and strength training routine. No matter how you incorporate HIIT, get it in your workout schedule for super-charged fat loss results. If you run because you love it, you can still run, but know that a steady-state long endurance run is not optimal for fat-loss.